How to identify counterfeit Gillette Mach 3 Razor Blades | iSpotFake. Do you? 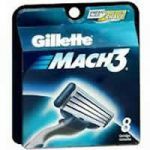 Counterfeit razor blades are a common item on eBay, China websites .The Gillette Mach 3 counterfeits may look authentic if not studied carefully. If compared to an authentic product, there are differences in the cartridge and blade packaging, but variations in packaging make it very difficult for consumers to identify a counterfeit. Don't let authentic looking packaging fool you. This counterfeit has authentic looking packaging, quality printing and raised embossed lettering.Consumers would be challenged to identify it visually as a counterfeit. Variations in packaging make it difficult for consumers to identify counterfeit products. This package is counterfeit. The best advice; buy authentic products from authorized Gillette retailers. The authentic Gillette Mach 3 Razor Blade is a quality manufactured precision shaving cartridge.If you have any doubts about the authenticity of your Gillette Razor Blades, contact Gillette. The white & blue lubricating and wear strip actually contains a moist lubricant. Counterfeit strips are a dry plastic. On this counterfeit Gillette Mach 3 cartridge, the lubricating strip was just a piece of plastic. If you run your fingernail along the strip, it is smooth. The lubricating strip on the authentic Mach 3 lubricating strip is rough. The blue bottom strip should be soft and pliable. You should not be able to damage it easily with your fingernail. The ridges should resume their normal micro-aligned position after being moved about. Blades on the authentic Gillette Mach 3 will be perfectly aligned and parallel (indicated by the dashed green line). They should not be uneven, wavy or misaligned. A keen eye is needed to see the differences in manufacturing on the rear of the authentic and counterfeit blades. The plastic on this counterfeit is much thicker than the authentic blade. Compare the space between the blades indicated by the red arrows. The dots on the blades are also misaligned, both indicators of a counterfeit blade. Buy from reputable authorized Gillette retailers. If you have doubts about the authenticity of your Gillette Razor Blades, contact Gillette. Previous Previous post: How to spot fake Guerlain perfumes.